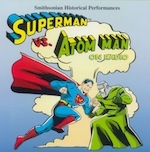 The Atom Man demonstrates his amazing radioactive powers by destroying the secret Nazi cave headquarters and surrounding forest. Heinrich Milch is given a new identify as Henry Miller and is sent to Metropolis by Der Teufel. His mission: destroy Superman!